I received my November Julep Maven Box and liked the colors I picked out and had totally forgotten about the “Pumpkin Spice Mystery Polish” I’d added. I was happy with Julep Kerry but it looked very familiar. I was thinking that the matte metallic looked a lot like Sally Hansen Satin Glam Go Gold so I went to my swatches to see if I was right and the first possible dupe I found was – you guessed it – Kerry! Julep Kerry came from last year’s Matte Metallic collection that I made sure to get almost all the colors of. Disappointed! First, I was expecting something more orange or brown to qualify for a “Pumpkin Spice” polish. Second, of course it was a bummer to get a polish that I already have. I do really like this color, and it fit in with what I was thinking to be my first November fall manicure, so I dug out my existing bottle, boxed up the one I just received today, and put together a classy, subtle fall manicure! 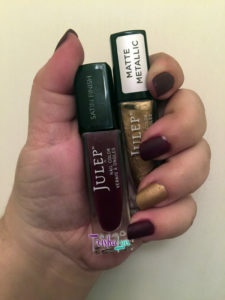 After looking at my swatches for a nice dark burgundy, I picked out another Julep polish, Julep Mary Lee. Mary Lee promises a nice satin finish, but that usually gets negated by whatever top coat used. I haven’t gone with an accent nail in awhile, so I painted my ring finger nails with Julep Kerry and the rest of my nails with Julep Mary Lee. At first, I put a top coat of Glisten & Glow HK Girl – Fast Drying + Super Shiny Top Coat on the burgundy nails and essie matte about you on the gold nails to maintain the matte. I wore the nails that way for all of 30 minutes before I decided that a totally matte manicure would look better, so I put the matte top coat on over the glossy. So here’s the giveaway! You have from now until Sunday, November 20th at 11:59 PM to enter. There are several tasks you can take to enter, as shown below in the Rafflecopter giveaway. This giveaway is only open to United States residents since I am fronting the shipping costs. You will receive the brand new, packaged bottle of Julep Kerry and a pre-painted and labeled swatch stick. MAY THE ODDS BE EVER IN YOUR FAVOR! I like different shades of blue and other neutral colors.